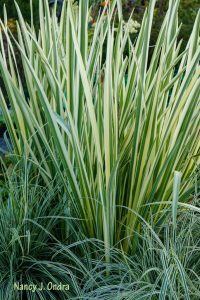 We normally suggest spring and fall as ideal times to plant, to take advantage of the cooler weather and more dependable rainfall. But when you’re dealing with a site that’s mucky during those times of the year, a dry period in summer can be the best time to get a new garden started. It tends to be much easier to get the weeds out and do any needed digging when the soil is somewhat moist but not muddy. 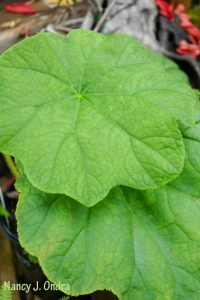 Ample moisture supports lush, leafy growth, so these sites are ideal for perennials that produce big, bold leaves: ligularias (Ligularia), rodgersias (Rodgersia), astilboides (Astilboides tabularis), umbrella plant (Darmera peltata), and skunk cabbage (Symplocarpus foetidus), to name a few. 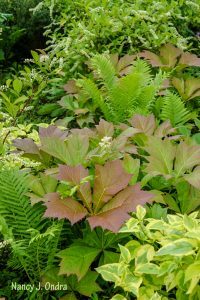 Once you’ve chosen one or more of those bold beauties, then add some other foliage shapes to create dramatic textural contrasts. Ostrich fern (Matteuccia struthiopteris) and royal fern (Osmunda regalis) offer a lovely lacy look, while Japanese iris (Iris ensata) and common rush (Juncus effusus) contribute slender, spiky leaves to the show. There’s no shortage of fabulous flowering perennials you could include as well. Add a tropical touch with huge-flowered hardy hibiscus (Hibiscus); enjoy the elegant spires of brilliant red cardinal flower (Lobelia cardinalis); or smile up at the cotton-candy pink froth of queen-of-the-prairie (Filipendula rubra). 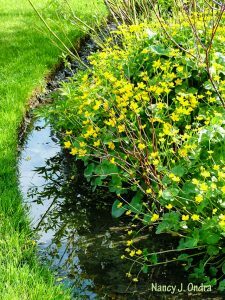 There are charmers for closer to ground level too, such as glowing golden marsh marigold (Catha palustris) and pretty Japanese and candelabra primroses (Primula). 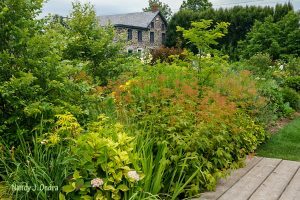 If you’d like to see some of these plants in action, come to Linden Hill Gardens and check out our “rill” area, located between the nursery and the formal garden. Our soil tends to be on the wet side in general, but this swale, which is designed to carry the water that runs off the barn roof, stays quite soggy for much of the year. 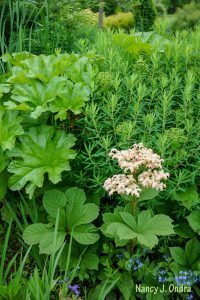 Besides serving this practical purpose, it’s a terrific source of inspiration for your own garden, as it supports a wide variety of moisture-loving perennials, shrubs, and trees that are well adapted to our regional growing conditions. 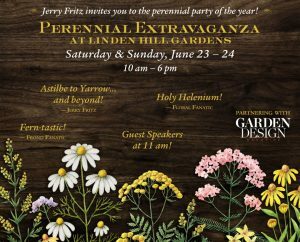 Join us for our special weekend event and learn more about these “wet-feet” loving plants (and more)!